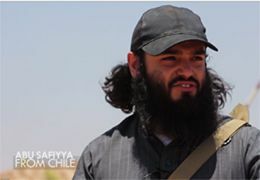 I've been wondering about the real identity and background of the English-speaking Chilean ISIS tour guide from the group's End of Sykes Picot video. Is Abu Saffiya really a fighter, or an actor hired by ISIS's production company? He seems straight out of central casting. Where is he really from? I haven't seen pictures of him anywhere else. Would ISIS trust a basic street fighter to give such an important tour? Or does he play a prominent role in the group? He is very comfortable in front of the camera -- too comfortable for a "nobody."